A sea change has taken place throughout the culture of leadership; today’s emerging leaders are "opting out" of the same positions their predecessors coveted in years past. But many senior managers trained in traditional leadership still hang onto outdated approaches of command and control despite how much they’ve heard about "empowerment" and inclusion. At the core of this book is the fictional suspense story of Brookreme Corporation, whose leaders are challenged to chart a course to a global future, navigating relational land mines along the way. With both story telling and hard research, Leadership Divided reconnects generations and instructs both senior and emerging leaders on how the relationships of the future will be the path to revolutionary performance. Ron A. Carucci (Seattle, WA) is a founding partner with Passages Consulting, LLC, where he works with CEOs and senior executives in pursuit of profound organizational change and executive leadership capability. He is Graduate Professor of Leadership at Mars Hill Graduate School in Seattle. He is also faculty member at Fordham University, serving as Associate Professor of Organizational Behavior, and has served as an adjunct at the Center for Creative Leadership. His clients have included Edward Jones Investments, Bristol-Myers Squibb, Amgen, McDonald’s, PepsiCo, Gates Corporation, Accenture, and many others. RON A. CARUCCI is a founding partner with Passages Consulting, LLC, where he works with CEOs and senior executives in pursuit of profound organizational change and executive leadership capability. He is Graduate Professor of Leadership at Mars Hill Graduate School in Seattle. He is also a faculty member at Fordham University, serving as associate professor of organizational behavior, and has served as an adjunct at the Center for Creative Leadership. His clients have included Edward Jones Investments, Bristol-Myers Squibb, Amgen, McDonald's, PepsiCo, Gates Corporation, Accenture, and many others. He is a frequent conference and keynote speaker, addressing a wide variety of audiences. 1 A Level Playing Field: The Death of Rank, The Dare of Exposure. 2 A Great Cup of Coffee: The Death of Veneer, The Dare of Depth. 3 A Voice at the Table: The Death of Deception, The Dare of Invitation. 4 An Imaginative Dream: The Death of Monotony, The Dare of Dreaming. 5 A Diamond in Formation: The Death of Arrogance, The Dare of Generosity. 6 A Grateful Champion: The Death of Patronizing, The Dare of Gratitude. Epilogue: Bridging the Divide; Go First to the Estuary. According to Carucci, emerging leaders believe that incumbents are self-aggrandizing workaholics and poor role models who often abuse their power. They are perceived as manipulative, Machiavellian, and devoid of emotional intelligence. By contrast, incumbent leaders feel that the emerging generation is overemotional, undisciplined, and puts too much stock in creativity, teamwork, and consensus. Its members lack the true grit needed to lead the workforce through the upheavals of the twenty-first century. Carucci’s stated and laudable intention is to inspire both sides to start a discussion about leadership. Unfortunately, he undermines his project by siding (sometimes naively) with the emerging generation—for instance, quoting with approval a regional manager who says he would want to be remembered “simply, as the man who put a smile on the face of all who he met.” We are a long way here from Jack Welch and Lou Gerstner and even Bill Hewlett and Dave Packard. Not that these leaders had all the answers. But the alternative Carucci favors seems so, well, touchy-feely. Of course, generational differences have been around for a long time. Yet Carucci argues that there is an unusually wide chasm now between generations, which organizations can’t ignore. When emerging leaders were asked whether they would refuse a promotion if their bosses’ values were at odds with their own, for example, more than 80% said “absolutely.” The consequences for management are hardly trivial. Can anything be done to bridge the gap? 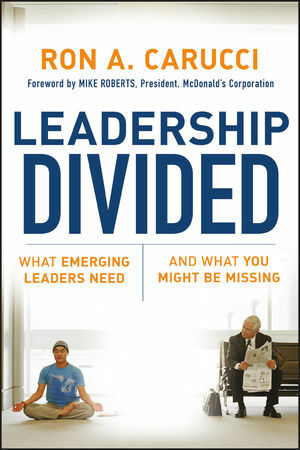 Perhaps the best suggestion comes in the foreword by former McDonald’s president Mike Roberts. “I know that vulnerability and hurt—and ultimately, loss—contribute to leadership in ways I can’t articulate,” he writes, after discussing his daughter’s cerebral palsy. Incumbent leaders have something important to learn from Roberts’s emotional candor, even though it goes against all their instincts: Opening up could make them better leaders and more appealing to their followers. Many emerging leaders are still too young to understand how hurt can help them temper unfettered openness with emotional restraint. As they learn to do this better, they may become more balanced leaders and more accessible to the incumbents to whom they must relate. If they meet this challenge, emerging leaders may avoid repeating tomorrow the mistakes of the previous generation that they so roundly condemn today.